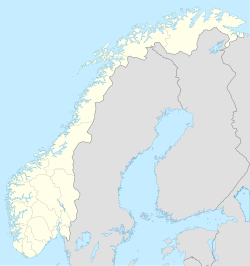 Fiskenes is a village in Andøy Municipality in Nordland county, Norway. The village is located on the northeastern part of the island of Andøya, along the Andfjorden. The village of Andenes lies about 10 kilometres (6.2 mi) to the north, and the village of Skarstein lies about 2 kilometres (1.2 mi) to the south. The population is approximately 50 people. ^ "Fiskenes, Andøy (Nordland)". yr.no. Retrieved 2019-01-01. This Nordland location article is a stub. You can help Wikipedia by expanding it. This page was last edited on 1 January 2019, at 20:49 (UTC).